Something from Sinister Grin Press. 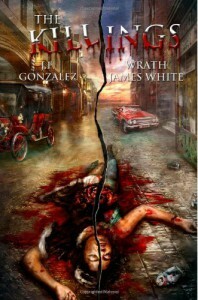 My latest book is a great title, The Killings written by the amazing collaborative talents of JF Gonzalez and Wrath James White. I started this last night and was surprised by the images this title leaves with the reader. The Killings is well written, brutal, and mean. I'm really looking forward to this book. You can find this title here. A thank you goes out to Sinister Grin Press. Check them out online here.